On stackapps, there is a broad spectrum of apps designed by users to improve their Stack Exchange experience. Most apps are oriented toward Stack Oveflow and do not necessarily address the needs and desires of the MathOverflow community. There are many reasons for this, the most obvious is that Stack Overflow has plenty of users that are avid coders. Some of our users are experienced and avid coders, so there is a definite possibility to have MO apps. Are we ready to get started? Building a first MO app might help others to see more possibilities and create more MO apps. Moreover, having one MO app with reusable MO specific code will reduce the workload for later MO apps. Check out stackapps and the SE 2.1 API to see what is possible. What would you want this first MO app to do? Would you volunteer for such a coding project? I would like the app to list the questions in some orders (by edit time, type, or some other ranking) with abbreviated but expandable fields. In particular, I want to know if there was just a comment added, or an edit of more than or fewer than 10 characters to either question or answer. I might even want it to poll my favorites and show edits on just those. I could tweak code if there was a good base. I'm not prepared to write one from scratch. 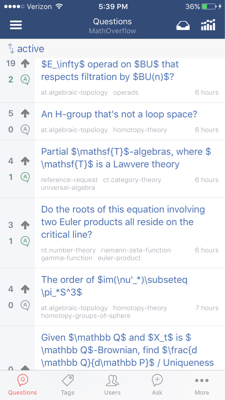 I use the StackExchange app, and I would like something similar which renders MathJax in question titles. That would create the MO app that I want. Does review feature encourage closing and flagging errors?